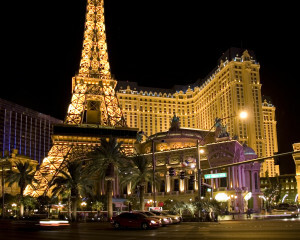 Las Vegas is a city of gambling and glamour, and is centered around the Las Vegas Strip. Thousands of people each year come to Sin City in hopes of hitting the jackpot, watch famous shows and performances, shop at high-end stores, and party the night away at the many exclusive clubs. With so much to do, Tripps Travel Network reviews a few recommendations for people who want to hit the strip. Although Las Vegas is notorious for taking people’s money and being extraordinarily expensive, there are several free shows that a variety of hotels put on. Out in front of the Mirage hotel, a huge volcano simulation is ready to erupt every night between 6 and 11 pm. Bystanders can watch the massive volcano erupt with fiery lava and ash. Another great hotel show is the dancing fountains in front of the Bellagio. These magical fountains go off every 15 minutes during the afternoon and dance to the classical music that blasts from the hotel. This mesmerizing water show is essential when walking along the strip.